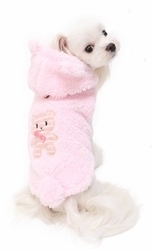 You can't help saying "awwwww" when you see your pooch wearing the Puppy Angel BBOBBO Jumper Dog Hoodie. Perfect for cooler days inside and out this Puppy Angel BBOBBO Jumper is beary cute! There is a striking striped teddy applique on the back wearing a little spotty bow-tie! The dog hoodie fastens using poppers down the chest and the hood can be attached to the back using the button.